St. Louis, Mo., October 7, 1912. Engine Company may be expected at any time. Second-hand machinery is in fair request. Collections are good. The Anheuser-Busch Brewing Association has begun the construction of a new power plant, a permit having been taken out for a building to cost $28,000 exclusive of equipment. It is to be supplementary to the large main plant. Fire in the power plant of the American Pressed Brick Company, St. Louis, October 2, caused $15,000 damage. The damaged equipment will be replaced. The S. Pfeiffer Mfg. Company, St. Louis, manufacturing chemist, has begun the construction of a new plant which will double its present mechanical capacity. Elevators, steam-heating plant, smokeless furnace and other equipment will be required in addition to special machinery. The St. Louis Motor Transportation Company, with $25,000 capital stock, has been organized at St. Louis, by W. R. and Frank Bush, Knox Taussig, William A. Thomas and Richard S. Locke for the maintenance of a repair shop, which is to be equipped at once, and also to equip hauling devices. The Charles Valier Company, St. Louis, is completing a grain elevator of 200,000 bushels capacity, which will involve an investment of $250,000 in equipment and building. 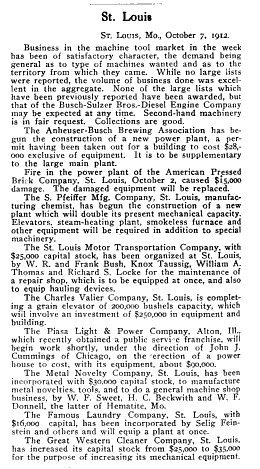 The Piasa Light & Power Company, Alton, Ill., which recently obtained a public servi e franchise, will begin work shortly, under the direction of John J. Cummings of Chicago, on the erection of a power house to cost, with its equipment, about $90,000. The Metal Novelty Company, St. Louis, has been incorporated with $30,000 capital stock, to manufacture metal novelties, tools, and to do a general machine shop business, by W. F. Sweet, H. C. Beckwith and W. F. Donnell, the latter of Hematite, Mo. The Famous Laundry Company, St. Louis, with $16,000 capital, has been incorporated by Selig Feinstein and others and will equip a plant at once. The Great Western Cleaner Company, St. Louis, has increased its capital stock from $25,000 to $35,000 for the purpose of increasing its mechanical equipment. 1) I knew from the St. Louis City Directories that my second great grandfather, Selig Feinstein, had opened Famous Laundry by 1914. I also knew that in 1912 he was managing Central Laundry. This article dates the incorporation of the former and provides a dollar figure as to the capital. 2) A search in Google Books for "Selig Feinstein" will not list this entry in the results. I had to search for "Selig Fein-stein". It's important to remember when searching archival databases which use Optical Character Recognition that many newspapers, journals, and books break up polysyllabic words with the hyphen.